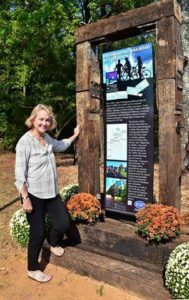 Please visit our Underground Railroad Historical Marker located at the end of the Tenn-Tom bike trail near the corner of Camp Ground Road and John Rankin Highway. This will mark the end of the first leg of your route. You can also fill your water bottle at the fountain located near the marker. Safe travels and we will see you in Fulton! Download the brochure for all the highlights of the Itawamba County route here UGRR Brochure .